R. R. Samarakoon’s ever popular stage play which had a long run both here and abroad, will be staged at 3.30 p.m. and 7.00 p.m. on May 5 at the Lionel Wendt theatre, Colombo. A social criticism of political manipulation and the ever-widening gap between the poor and the rich, the drama was first staged in 1978. Since then, for four decades it has been running to packed audiences. ‘Kelani Palama’ tells the story of a group of shanty dwellers under the Kelani Bridge who run to the bridge when the river overflows causing floods. The new cast with some of the original stars include Ramya Wanigasekara, Geetha Kanthi Jayakodi, Palitha Perera, Prasannajith Abeysooriya, Madhani Malwattage, Dimuthu Chinthaka, Prasad Sooriya Arachchi, Neluka Rekani and many other artistes. All seats are box planned and tickets are now available at Lionel Wendt theatre. 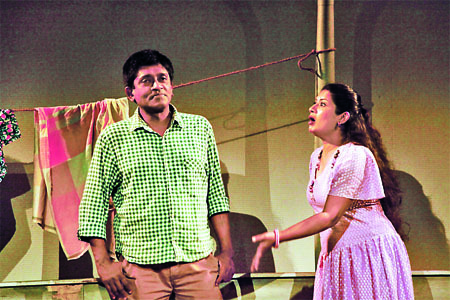 “Kelani Palama” is organised by Jude Srimal.